Publisher: Minneapolis : Kar-Ben Publishing,  ©2017Description: 1 volume (unpaged) : color ill. ; 17 cm.ISBN: 9781467752381 .Report number: BN-Fall 18Subject(s): Hanukkah -- Fiction | Jews -- Fiction | Spiders -- FictionGenre/Form: Picture books. | Juvenile works. 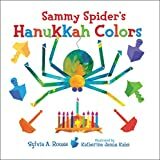 | Juvenile fiction.Summary: In this new board book addition to the Sammy Spider series, Sammy watches as the Shapiro's prepare for and celebrate Hanukkah. Young readers can identify the many familiar Hanukkah shapes that Sammy sees. In this new board book addition to the Sammy Spider series, Sammy watches as the Shapiro's prepare for and celebrate Hanukkah. Young readers can identify the many familiar Hanukkah shapes that Sammy sees.